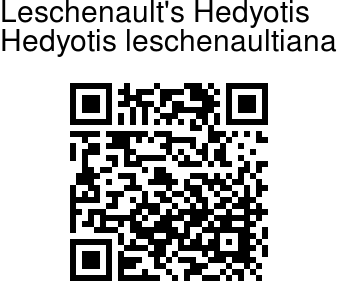 Leschenault's Hedyotis is a stout shrub, with branchlets floppy. 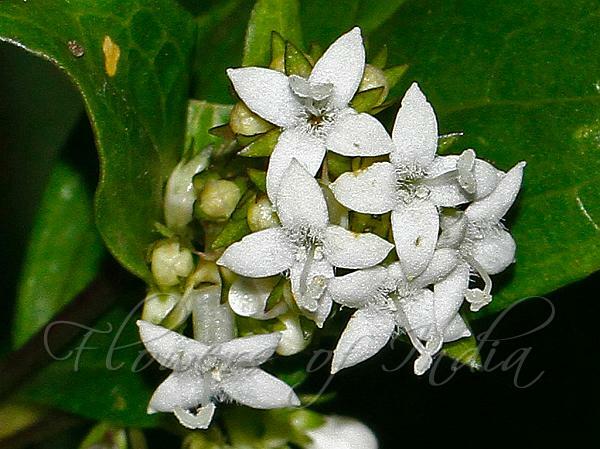 Flowers are pinkish or white, about 6 mm wide, tube 5 mm, hairy inside, petals 4, ovate-lanceshaped, about 0.5 cm long. Stamens 5. This plant can be easily distinguished by the presence of style protruding from the flower-tube. Flowers are borne in cymes in elongate, branch-end panicles, about 5 x 4 cm. Flower-cluster-stalks are up to 6 cm, bracts and bracteoles ovate-rounded, 3 x 2 mm lobes 4, ovate ca. 0.7 cm. Leaves are up to 6 x 2 cm, ovate to elliptic -lanceshaped, papery, nerves 4-5 pairs, base narrowed to pointed, tip tapering; leaf-stalk to 1 cm; stipules elliptic-lanceshaped about 0.8 cm, hairless margin pinnatisect. Capsules are ovoid, hairless 0.3 cm wide. Leschenault's Hedyotis is endemic to Southern Western Ghats. Flowering: November-March. Medicinal uses: The different ethnic communities in India have used different species of Hedyotis in the treatment of various ailments. Identification credit: Dr. Jomy Augustine Photographed in Eravikulam National Park, Munnar, Distt.Idukki, Kerala.